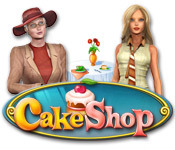 Help Emily bake and decorate cakes to make her way to the top of the culinary food chain.All the ingredients for a good time!Cake Shop bakes up its own special brand of Time Management fun! Slap together the different layers of tasty cakes for your customers. Manage customer patience with the help of piping hot coffee and cotton candy that will put a smile on the faces of their children. As your skills as manager of the shop improve, you'll be able to spend your profits on better equipment and even a new home where you can put up your tired feet after a hard day. Cake Shop has all the ingredients for a good time!